Forgive me if this is getting redundant. 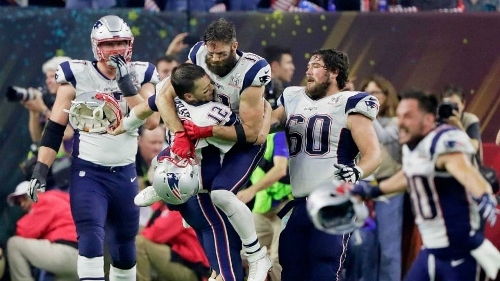 Your Super Bowl winner is… the New England Patriots. That’s ring number six for Brady/Belichick. Impressive when you run out of fingers on one hand and have to start using the second hand. Congrats to the entire Patriots team for a terrific season and for silencing the doubters who said the end of their dynasty was here. For the Super Bowl game itself, well, it was lackluster to say the least. It was the lowest scoring Super Bowl of all time. The first touchdown did not come until well into the 4th quarter. The punters played WAY too big of a role in the game for my liking. And the young Rams head coach Sean McVay and 3rd year QB Jared Goff looked outmatched by the grisly veterans on the Patriots. The MVP of the game went to Julian Edelman, the underrated stud receiver for the Patriots who is often overlooked but never fails to deliver in the clutch. Even in an ugly defensive battle, he managed a game-high 10 catches for 141 yards. He routinely picked up 1st downs, kept the clock going, and kept the Rams offense from being able to get more reps in and find their groove. I’m not sure where this ranks in Patriots Super Bowl wins. It would seem that it would be towards the bottom, with a game like last year’s improbable comeback versus the Falcons ranking at or near the top. However we all live in the moment, and I’m sure if you asked Brady or Belichick where this trophy ranks, they would argue it’s at the top of the list, because it’s the one they’re holding right now. And I wouldn’t blame them for that. We’ll see if the Patriots can keep this train rolling next season. I’m sure Kansas City, New Orleans, the Rams and the like will have something to say about that. Can we start the countdown already until next season?